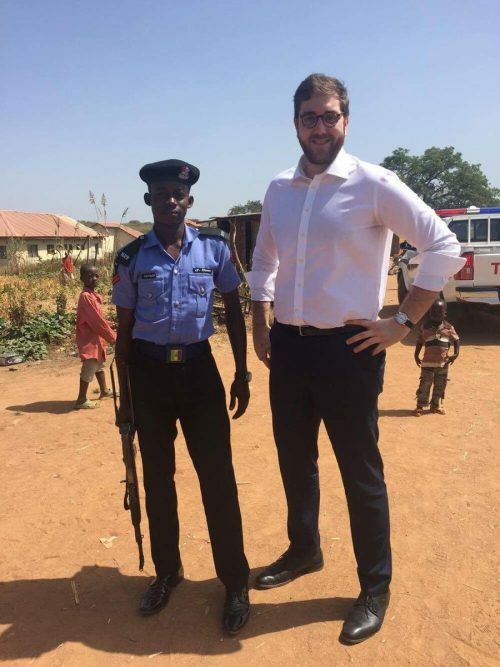 Péter Heltai, the 26 year old Ambassador-at-Large of the government aid agency called Hungary Helps, posed for a photo with residents of a Nigerian village, tweeting: “Just went back a ‘few’ hundreds of years in time.” Perhaps it was his lack of experience in the field of international aid that is behind a tweet that comes across as tone-deaf and patronizing. After all, Mr. Heltai’s appointment as Ambassador-at-Large is a curious one, considering that his only prior experience involved a handful of short internships, volunteering with the boy scouts and Model Parliament–a program where students are acquainted with how parliament works. In November, Mr. Heltai visited a Christian school in the town of Erbil, Iraq, that had been rebuilt using Hungarian government aid and now bears a large “Hungary Helps” sign. 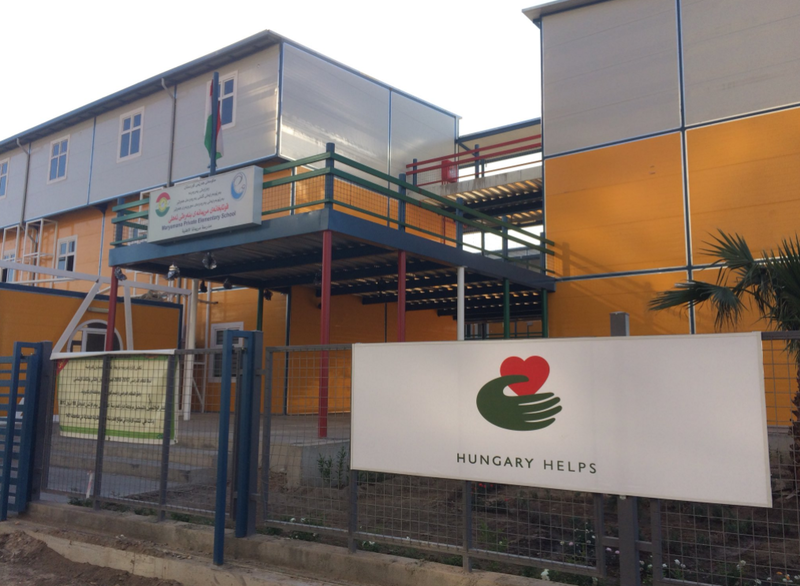 A Christian school built in Iraq through Hungarian foreign aid. “Spent an incredible day in Telsqof. Thank you for being real, living testimonies of Jesus Christ and his Church by not losing your hope and joy despite all the suffering and persecution. Hungary will never forget you,” wrote Mr. Heltai. “Children are the future of every community. After the terror and brutality of ISIS life starts to return to this little Christian village,” he added. HVG asked Mr. Heltai whether or not it was discriminatory that Hungarian government aid appears exclusively geared towards Christian, while there are people in need of other religious backgrounds too. Mr. Heltai asked the publication to formulate its questions in writing, but no answer has been forthcoming. Ambassador at large (which is a gratuitous slap on the back more than a formal position). While I am very interested in critical foundation and discovery of wrong doing, I just don’t see it here. In fact, it seems a bit academically condescending to judge him so cynically without underscoring the absolute reason for his misappropriation of funds and (pseudo-colonial?) sinister patronizing passive transgressions you seem to imply. Either we are missing the trail of government money being appropriated deceptively bu unmentioned agencies, or the trail of sectarianism being exploited politically. In either case, the level of innuendo is not supported in this article coverage, and should be better framed. I don’t think anyone is suggesting misappropriation of funds, corruption or anything illegal. HVG, one of Hungary’s leading national weeklies, however, wrote a strongly-worded article expressing concern about the fact that the Hungarian government appears to be following a “Christian foreign policy” (HVG’s words), and wondered whether this “clericalism” is appropriate. HVG also wanted to find out more about the Hungary Helps budget and its public funding. Mr. Heltai refused to answer any of their question when HVG journalists caught up with him at a conference. It should also be added, that Mr. Heltai’s Twitter feed includes re-tweets of some questionable content, including anti-migrant and anti-refugee material. As well, it is entirely legitimate to question why the government selected Mr. Heltai for this position, considering that nothing in his professional or volunteer experience suggests that he is a natural fit. So are you suggesting that it is somehow ideologically incorrect, to be anti-migrant, and that anyone expressing such views should be discriminated against when hiring? Crazyhorse was anti-migrant. He fought a war meant to keep European settlers out of his people’s ancestral native territory. They are currently carving out a statue in his honor, which will be bigger than mount Rushmore. The Dalai Lama is anti-migrant. He doesn’t think that any other culture should be settled into Tibet. The whole nation of Japan is pretty much anti-migrant. They feel very strongly about preserving their distinct culture and ethnic heritage. Are you saying that all this is wrong and condemn-able, punishable with hiring discrimination? Perhaps in Canada! As for the other main objection, namely his qualification, perhaps valid, but should be put within proper perspective. This is what typically happens in most government. People hired on merit? Hah! The appointment is a formal rank granted by the Forreign Affairs Minister as per Gov Gazette. The person’s intentions, largely irrelevant here, could have been perfectly realized by his working under this program as an officer. 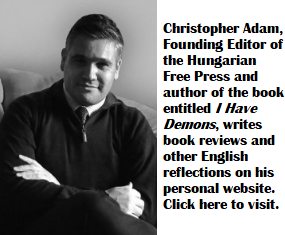 The whole program however has to be considered in the context of the current Hungarian regime, more specifically its cynical use of the “Christian” label to blow smoke over its many inhuman and anti social policies and acts. The HU government is very very selective in their aid to others, i.e.ONLY to Christians, if it can be considered just plain discrimination should be investigated!! Is the Good Samaritan may be missing in the Hungarian Christian books? As far as I know the international ‘Church in Need’ has a priority in giving aid to ‘fellow’ Christians, but NOT limiting their aid to Christians ONLY! Careful! Your anti-Christian bias is showing here! I am not a believer myself, but fact is that in the past decade or so Christians in the ME-Africa region have become particularly vulnerable to attacks, discrimination and cleansing. For instance, in 2003 1.5 million Christians in Iraq, while right now estimated at 450,000 as of 2013. We have seen brutal attacks elsewhere, like in Syria, Egypt and other places. 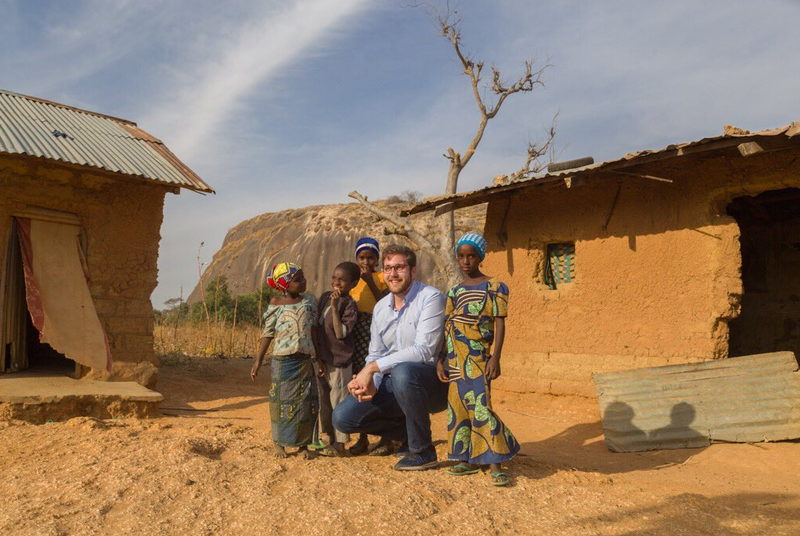 The Western World has been largely absent from lending these communities much suport. Interesting statistic is the fact that from all the Syrian refugees taken in by US, over 99% were Muslims, even though about 10% of Syria’s population is Christian, and Christians have been particularly brutally treated by the Islamist armed groups. I understand that Western World hatred of Christianity runs very deep among liberals, but surely we cannot vilify Hungary for singling out this group for aid, given how reticent Western elites have been in aiding these people, which are facing particularly brutal times at the hands of the Muslim majority they live among in that region. Have to say that I find such mentality as displayed in this article to be sad! There is no religion test for US immigration. Do you don’t know how many Christians applied there? So, one million Christians fled Iraq, do you know how many took refuge in Europe? We know that Hungary didn’t want any, but those who pay the Rogan capo-regime. (and don’t reheat the big lie about 1000+ Copts, whom even fellow Copts didn’t know about). Anti religion bias, I subscribe to that, because the concept of faith and accepting things on authority is contrary to the concept of evidence supported reasoning. Furthermore, religion and state should be separate. Bribing selected institutionalized religions to fight along in ideological and political fights is what I hate, particularly as in the case of what the Orban’s fascist regime is doing to education and social division. Watch out! Your anti-everybody else bias is showing here! Not a believer either, and your first facts seem correct, but you are insinuating that the US gives more protection to Muslims than to Christians. And that’s a lie! Furthermore ‘your understanding’ of hatred among liberals, is utter bulshit, and says most about your own hatred. Furthermore the aid the Hungarian government is providing is pushed by them so much in the media, that it seems much more than it really is (almost zero), and their selective aid to Christians ONLY, is on or over the very border of discrimination. Similar like their treatment of refugees and migrants being on or over the border of inhumanity! Similar like the mentality you display in your comment, I have to say I find to be sad! If the objective of the aid program is to support a minority population that is increasingly discriminated, subjected to abuse and demographic cleansing, then I fail to see how that would be discrimination. Using that same argument, all the charities that single out the Romanyi communities in Hungary, Romania or elsewhere for aid would be discriminating as well. The fact that you think that targeting Christian minority in ME for aid, as a response to them facing increased hostility is wrong, while most liberals would never accuse the likes of Soros of “discriminating” by targeting some of its NGOs to exclusively aiding the Roma minority in parts of Europe, is in fact proof of general anti Christian bias among liberals. You just proved yourself to be such an example, which fits rather well. First I didn’t say it’s plain discrimination but around it’s border. Second again you miss the point, the Hungarian government is singling out for aid Christians only, all over the world. Charities are giving aid to all who need it, all over the world, so that can be Romanyi in Hungary, and Christians or other religious minorities elsewhere. THAT’s the main point here!! Let’s check the points you didn’t comment. You seem to accept that your insunuations were not correct. And ah, you seem to agree that aid by the Hungarian government is close to zero, while blown up in ‘their own’ like really being something. Good you seem to be of that opinion also. Heltai is a friend of Orban.